Bring on the holiday baking! I am starting with these Gluten Free Sugar Cookies. These gluten free sugar cookies are perfect for cookie swaps and parties. They contain far less sugar than traditional cookie recipes. I think my 5 Minute Healthy Frosting would be great on these! 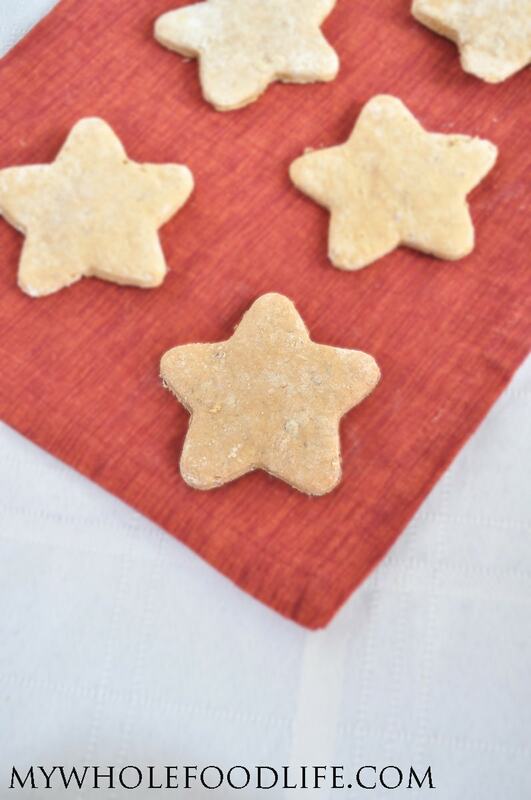 This healthier sugar cookie recipe is also vegan in addition to being gluten free. All you need is 9 ingredients! I used palm shortening in this recipe and here is why. One of the key ingredients in sugar cookies is butter. I don’t want to use margarine or some other kind of vegan butter. I also didn’t think coconut oil would have worked in this recipe. So I used the palm shortening. I used Nutiva palm shortening which comes from a sustainable source. Since it’s not something I use on a regular basis, I was okay with it in this recipe. One thing I did different than most sugar cookie recipes is that I cut the sugar amount in half. Traditional sugar cookies made gluten free and vegan. Much less sugar in this easy recipe. In one bowl , mix all the dry ingredients together. In another bowl , mix the softened shortening and the sugar together. Then add in the vanilla and flax eggs. Add the dry ingredients to the wet and mix only until combined. If the batter looks too dry, add in the almond milk one tablespoon at a time. Cut the dough in half with a bench scraper . Wrap both pieces of dough and place in the fridge for 20 minutes. Grab one piece of the dough and roll onto a floured surface until it's about 1/4 inch thick. Cut into shapes. Place the cookie shapes onto a lined baking sheet. Bake for about 10 minutes or until the cookie edges turn a golden brown. Let cookies completely cool before removing them from the baking sheet . Repeat these steps with the second ball of dough. Store these cookies in an airtight container in the fridge. You can also freeze them for longer storage. Enjoy! These look perfect! All of my nieces and nephews are gluten-free and I think I need to make these for them. I think that is a typo. I paid like $7 for mine. Thank you for this nice and simple gluten free cookie recipe. I'm always looking for a recipe to make with the grandkids! Perfect for the holidays. I do paleo so could I use almond flour instead and if so how much? I'm not sure. I think if you use almond flour, you will need to add more eggs. Thanks for sharing that! I would love to know if it works so I can tell others. Do you think I would be able to get the palm shortening at a Hy-Vee? Maybe? Kroger has it. Target does too. Is Palm Shortening a Saturated Fat?..same as Palm Oil? I think I remember in Nutrition class the mention of Palm Oil. The same stuff they add to popcorn in the movies...bad stuff. It's made from coconut oil and palm oil. There is a lot of new info nowadays about coconut oil and palm oil not being as unhealthy as we once thought. If you still want to avoid it, you can use vegan butter or regular butter if you eat it. I am still on the hunt for that perfect gluten free sugar cookie recipe. I will definitely try these out! Thanks! Would ghee work in place of the palm shortening? I have never used ghee, so I am not sure. I am guessing yes? I think spelt will work great too. Just made a variation of these using butter and real egg. They turned out delicious. Going to frost with a lemon icing for my daughter's holiday secret santa exchange. thank you again! Do you think that the shortening could be replaced with coconut butter? Maybe? I haven't tried to say for sure though. It shouldn't have fallen apart. I am sorry that happened, but glad they tasted good! Did you roll out and cut into shapes, or did you make more of a thumbprint style cookie? These are probably the best gf sugar cookies we have made, and I've tried a lot of recipes! They rolled out easily, cut and transferred to the baking sheet well, and are soft with a slight crunch on the outside. I used butter and real eggs, plus a combo of sorghum and oat flour, and baked for only 8 or 9 minutes. So good! Yay!! So glad you liked them Lydia! Do you think the dough could be frozen?